The Rich Gang have Prince MJ replacing the late Ivan Semwanga as SK Mbuga and Bryan White dominate the space of the loaded. The Rich Gang Crew by the late Ivan Semwanga had for sometime been the most flamboyant loaded group until May this year when their President passed on, they have since replaced him with a one Prince MJ and their Rich Gang Party is slated for Dec 19. Other than King Lawrence's AMG GT and ED Cheune's Bentley, there has been nothing to write home about. On the other hand, SK Mbuga who is more or less a solo entity has been down with the accident that almost left him for the dead days after the death of Ivan Semwanga, but that has not affected his game, he shipped in 4 ambulances for his hospital, bought an AMG for his wife and a Brabus cross country for himself and just recently, added a Lamborghini Aventador to his fleet that consists of a Rolls Royce, Ferrari among others. Bryan White has changed the way the game is played. Back then, some socialites could buy a few kgs of maize flour, sugar and dish out to the needy, which is a good thing, but Bryan White thinks those people should be given money to buy whatever they feel like buying. It should be recalled that when the late Ivan Semwanga, the first Ugandan to ship a Lamborghini into the country died, many, including Jack Pemba were seen trying to assume his shoes, but in the end, they've failed miserably. Jack Pemba was dragged to court by an airline company for unpaid airtickets amounting to over 100 million shillings, he opened up a hair saloon to make ends meet. Jack Pemba's customized rides are not enough to keep him afloat on the social radar, he is literally done. Just recently, he tried bull dozing Bryan White at Auto Spa in Munyonyo asking the bar management to throw him out, he was told that, he is the loaded guy on the block. Bryan White then pulled out a pack of green bucks and put them on the table, Pemba just coiled his tail and walked out never to return. 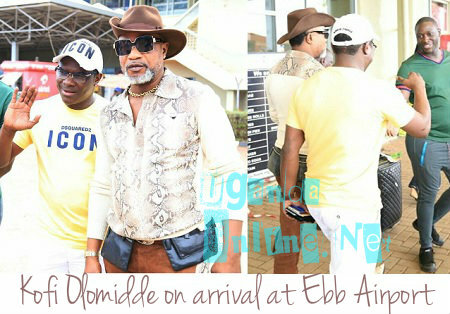 The next sighting was a few days in Dubai where he was with SK Mbuga mapping out a plan of dealing with Bryan White who is eating into their space, though for SK Mbuga, he has stood the taste of time and his hospital alone that is under construction puts him a class apart. SK Mbuga is way ahead of Bryan White much as he does not give out money, however, you can be sure to eat big when you help him have his Facebook account verified, fake accounts have made life difficult for him lately with the latest fake account running a campaign of giving out one of Mbuga's posh rides. Bryan White's style and generous ways have made others to rethink their strategies. The trick has always been to come up with a party and give out a few shillings plus an open bar, but looks like that might not work out well this time around. The above amount which is 41,945,000/- is less than the amount he gave to Express FC and Wankulukuku fans.